The 32nd annual Seattle Improvised Music Festival takes place on Feb. 2, 3, and 4 at the Good Shepherd Center Chapel, presented by Nonsequitur with support of a Neighborhood & Community Arts grant from City of Seattle Office of Arts & Culture. Doors open at 7:30, music starts at 8 PM. Nearly all of this year’s artists are playing SIMF for the first time. 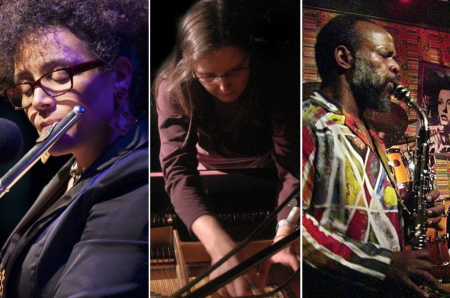 As in last year’s festival, three esteemed visiting artists — pianist Lisa Cay Miller (Vancouver), flutist Nicole Mitchell (Chicago), multi-instrumentalist Douglas R. Ewart (Minneapolis) — and an array of Northwest improvisers will meet over the course of the weekend in multiple duo, trio, and quartet configurations curated by this year’s festival organizers Greg Campbell, Kate Olson, and Steve Peters. However, instead of three long sets per night, there will be three 20-minute sets plus an additional 30-minute set featuring one of the visiting artists playing solo and/or with other musicians of their own choosing. Other new features include a workshop for improvising dancers and musicians on Saturday afternoon and a potluck/community discussion afterwards. Check back here for other new developments. 1:00-4:00 PM – Improvising Together: A Listening and Playing Workshop for Dancers and Musicians led by dancer Sheri Cohen and musician David Knott. We’ll use listening practices and interactive scores to illuminate the material shared between musicians and dancers and make our improvisations clearer and richer. ENROLLMENT IS FREE but limited to 12 musicians and 12 dancers. Please register by January 28. 5:00-7:00 – Potluck + Future Visioning Session Please join us for an early pre-concert dinner and lively public discussion about the future of the Seattle Improvised Music Festival. This is an opportunity for members of the Seattle improvisation community – artists and listeners alike – to offer input on how we might proceed going forward. Identifying problems is great, but we especially encourage you to propose solutions. Anyone is welcome, just bring some food or drinks and brilliant ideas to share.